The subtitle is...... "Alone in a cabin in the Middle Taiga". 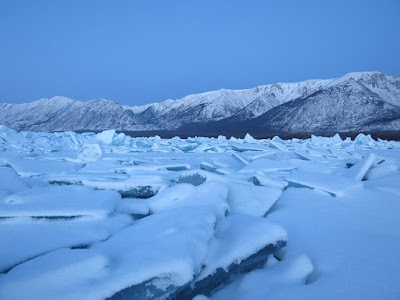 Sylvaine Tesson, French travel writer, adventurer, philosopher and environmentalist spent six months in a 3 m x 3 m cabin alone on the shore of Lake Baikal during the winter and Spring of 2010. He wasn't entirely alone he was visited by birds, bears and hardy Russian fishermen, during the latter half of his sojourn he had two dogs for company and as an anti-bear patrol. The hermit was delivered to his cabin in a truck on the ice of the frozen lake from Irkutsk along with basic food, a library of literary and philosophical classics, vodka, Cuban cigars and a satellite phone. That's a long list of stuff but he wasn't trying to prove he could survive in the Taiga his objective was a meditation on solitude. There is a catalogue of understated adventure on mountains, in the forest, kayaking, fishing and prodigious vodka drinking with his Russian visitors. His liver must be in one hell of a state. The sat phone played a role too, he was "dumped" in a text message by the love of his life during the longest darkest days of his personal winter. It's a meditation on that too. You might ask," if this book is set in an overheated cabin, with seemingly endless supplies of vodka and cigars, where's the outdoor adventure? Read it! Winner of the Medici Prize for travel writing in 2011 track it down in library or book shop. Where do we get our environmental values?